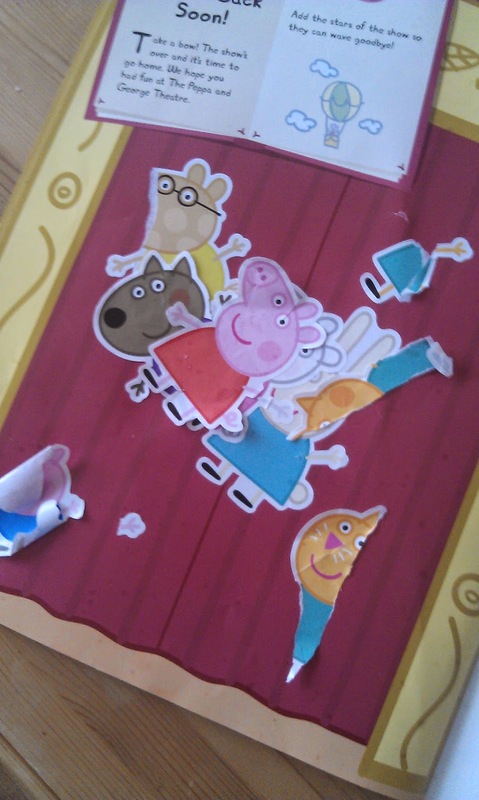 We recently bought our daughter a Peppa Pig sticker book. This is partly because she is obsessed with Peppa, and partly because I am obsessed with looking up 'travelling with toddler' tips on Pinterest in preparation for our holiday this year (you know, the one I haven't actually booked. Argh) and every pin I see suggests that stickers are the ultimate tool for parents trying to keep small children occupied on planes. 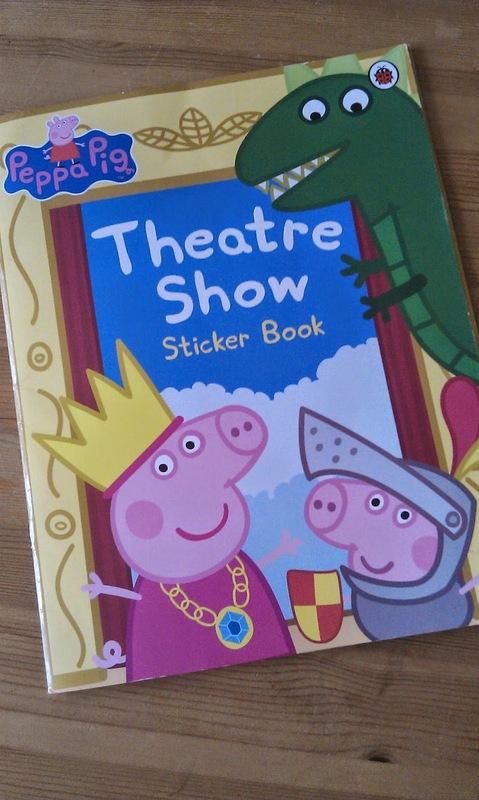 I have become somewhat obsessed with the idea of buying sticker books. So we bought one. To, you know, test it. Initially I was in my element because as a kid, I flipping loved sticker books. 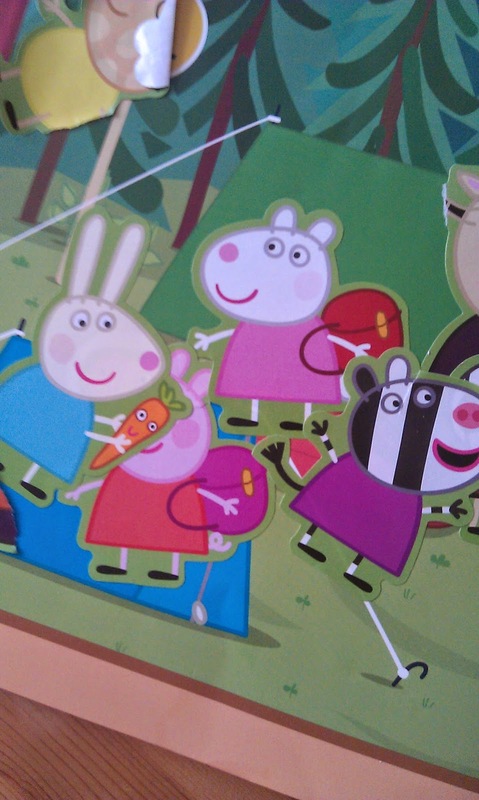 I had a kind of grave responsibility about me when I had a new sticker book. Must put them in the right place, must put them in the right place. However, I forget that I am parenting a destructive toddler and not a quiet, careful primary-school aged child. 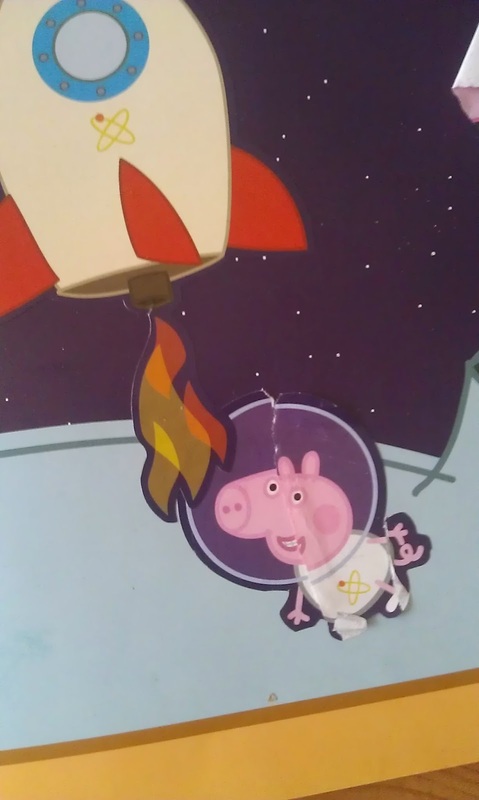 George Pig seems quite happy in spite of his impending suffocation due to the enormous crack in his space helmet. She just doesn't get the concept that once the sticker is on, it's on, and you can't peel it off again. Or rather, you can, but it will rip. Jellybean doesn't really mind them ripping though. She says 'Uh oh!' merrily whilst discarding half of Danny Dog's face over her shoulder. You remember that scene from Toy Story 3 when the toys are left in the toddler room at the nursery and nearly get destroyed? It's a bit like that. The only page that remains unscathed. Because the stickers are too fiddly to peel off. We have finished putting the stickers in now. And she's still obsessed with it. You're supposed to make up your own stories, which is, er, interesting. The only story I can possibly tell on the Dinosaur Park page is one of unspeakable horror. That's right. 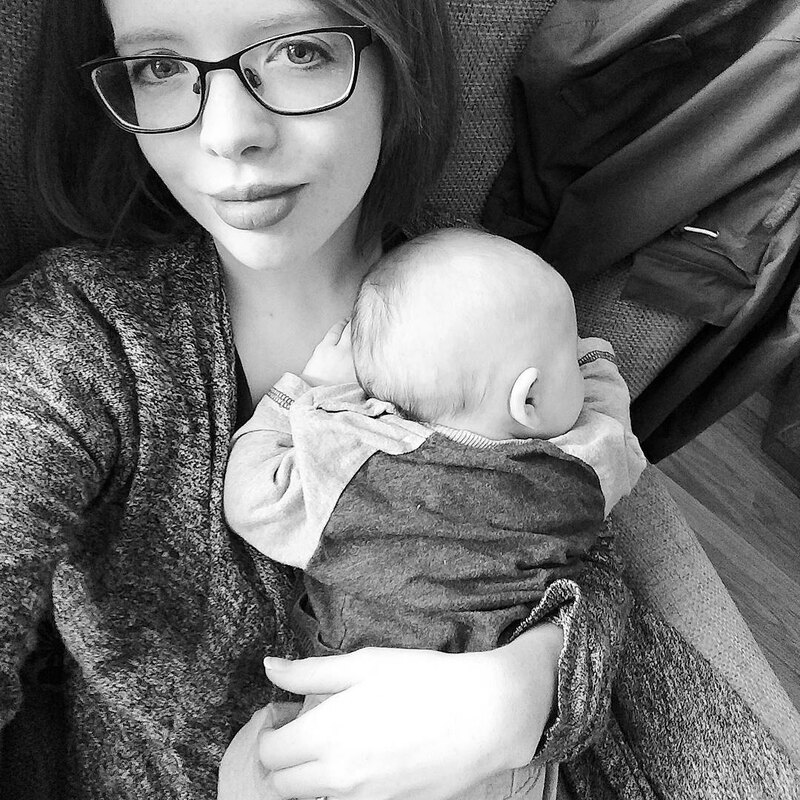 That's a seventeen month old. 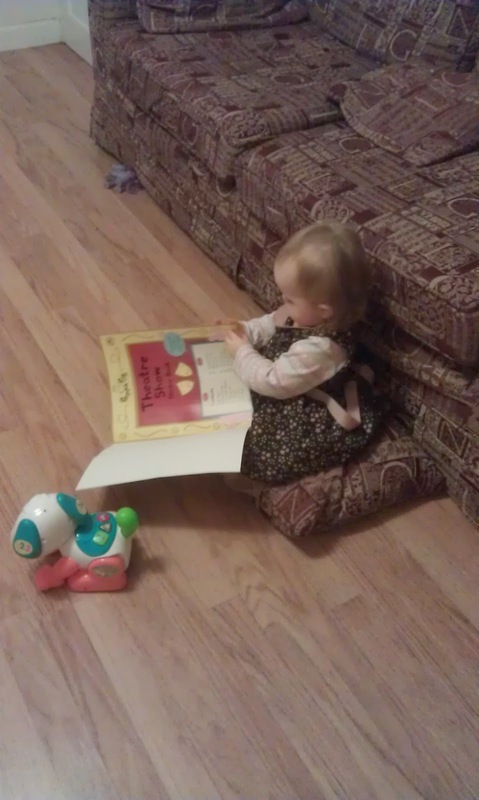 Looking at a book. Not running around the house. Not demanding chocolate or bananas or television. Not trying to put her hands on the hot radiator or her fingers in plug sockets. Not trying to climb the stairs or empty my kitchen cupboards. Just sitting. By herself. Reading. Which definitely makes the sticker ruining worth it. 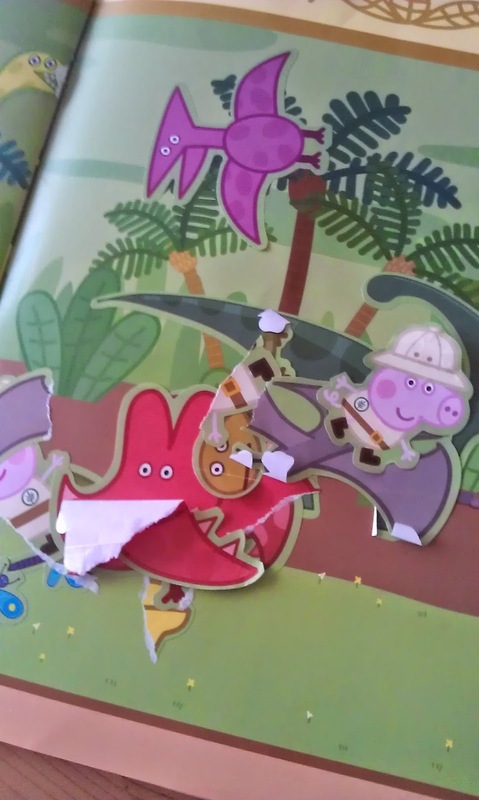 Parents of toddlers: sticker books! They are the future! Just get used to finding half bits of stickers all over your floor. 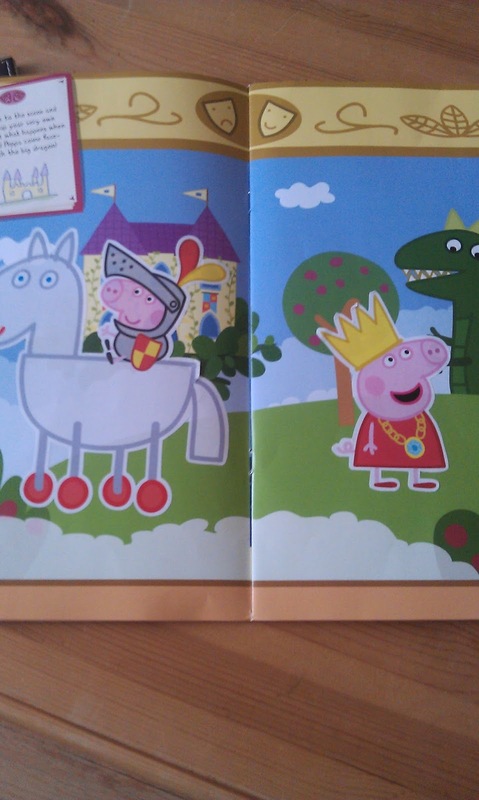 Holy God - sticker books are the bomb. We may well bankrupt ourselves, buying out entire ranges on Amazon, but who cares? They love them!